Roofing materials are a vital necessity in construction, as they comprise the primary barrier against natural elements such as rain. The growth of the construction industry in recent years has thus been vital for the global roofing market. The roofing market has benefited from the diversity of construction activities demanded across the world, as it has led to steady investment and consolidation of lucrative revenue avenues. The global roofing market is likely to exhibit consistent growth in the coming years on the back of the continued construction industry boom in developing regions. According to Transparency Market Research (TMR), the global roofing market is likely to exhibit a CAGR of 6.5% between 2017 and 2024. The essential driver for the global roofing market is the steady growth of the construction industry in developing regions and sustained demand for revenue generating operations from the construction industry in developed economies. Urbanization initiatives have picked up steam in several rising economies, which has driven the demand from the global roofing market, as a key part of the construction industry. Steady emigration from rural regions in underdeveloped regions is likely to lead to the formation of growing urban centers in several countries; the high volume of emigration is likely to ensure steady demand for new housing, leading to steady demand from the global roofing market. While the roofing market is matured in developed regions such as North America and Europe, renovation activities aimed at staying abreast of changing environmental regulations are likely to play a key role in the roofing market in these regions. The global roofing market is likely to interact significantly with the energy conservation initiatives being supported throughout developed countries, as roofing materials are exposed to the elements and thus comprise a key part of the building in terms of its environmental impact. Widespread adoption of environmentally oriented roofing systems could help establish an economy of scale, which would help players distribute the innovative materials in developing regions at affordable costs. High costs of advanced roofing materials remain one of the most influential restraints on the global roofing market, making these developments important for the market’s growth. The rapid growth of emerging economies in Southeast Asia is likely to help the Asia Pacific roofing market in the coming years, leading to the region establishing firm dominance in the global roofing market. Apart from urbanization initiatives, which have become key parts of the economic plans of several Asia Pacific countries, industrial growth in dynamic economies such as India, China, Japan, and South Korea is also likely to contribute significantly to the growth of the roofing market in the region. Asia Pacific accounted for over 40% of the global roofing market in 2015 and is likely to remain similarly dominant in the coming years. The Middle East is also likely to be a major player in the global roofing market in the coming years due to the rapid pace of construction in the affluent economies. Residential as well as industrial construction has prospered in the region in recent years due to the high pace of economic growth in countries such as the UAE, Saudi Arabia, Qatar, and Kuwait, and is likely to remain a key driver for the global roofing market in the coming years. The report profiles leading players in the global roofing market in order to shed light on the market’s competitive dynamics. Key companies examined in the report include Johns Manville, Carlisle, GAF, Atlas Roofing Corporation, Firestone Building Products Company, IKO Industries Ltd., and Owens Corning. The study analyzes the roofing market by segmenting it based on product, application, and region. Regional segments of the roofing market examined in the report are North America, Asia Pacific, Europe, Latin America, and the Middle East and Africa. The study examines drivers and restraints of the roofing market along with the impact of these indicators on demand during the forecast period. The report also covers growth opportunities in the roofing market at both global and regional level. The study includes market attractiveness analysis, wherein various application segments and countries are benchmarked depending upon growth rate, market size, and general attractiveness. The report comprises in-depth value chain analysis to provide a comprehensive view of the market. This offers better understanding of demand supply chain of roofing, right from raw material manufacturers to end-users. Additionally, Porter’s Five Forces analysis has been provided for insights into the competitive landscape of the market. The making of the report involved carrying out in-depth interviews and talks with a host of opinion leaders and key industry participants. Primary research represents the major part of research efforts, along with an elaborate secondary research. Secondary research phase involved reviewing key players’ product brochure, press releases, business annual reports, and relevant business documents for competitive analysis and market understanding. In addition, secondary research involved examining recent trade documents, internet sources, technical writings, and statistical data from government websites. This has proven to be the most effective, dependable, and successful approach to obtain precise market data, to obtain industry participants’ insights, and to recognize business opportunities. Secondary sources referred for this study include EPDM Roofing Association, Asphalt Roofing Manufacturers Association, International Green Roof Association, European Waterproofing Association, Roofing Coatings Manufacturers Association, Center for Environmental Innovation in Roofing, and American Society for Testing and Materials. On the competitive front, the report provides detailed insights into market shares and profiles of key players operating in the global roofing market. 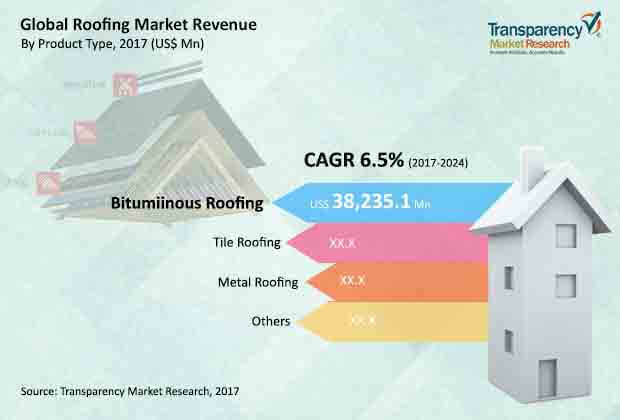 In addition, insights into key player’s competitive strategies and their competitive positioning in the global roofing market is provided herein. An analysis of indices of strengths, weakness, threat, and opportunities of key players is a highlight of the report. Key players profiled in the report include Atlas Roofing Corporation, GAF, Duro-Last Roofing Inc., Certain Teed Corporation, Brass Monier Building Group Services S.A, Johns Manville, Firestone Building Products Company, IKO Industries Ltd., Owens Corning, TAMKO Building Products Inc., and Carlisle. Business overview, financial overview, business strategy, and recent developments are the attributes each of the key players are profiled for.